Korean brands are such a huge trend right now due to K-POP dominating the whole nation. Many Korean brands are slowly coming to Indonesia's market like INNISFREE who opened their first store this year. This month, another Korean cosmetic brand has came and it is none other than SKINAZ! You are probably wondering what brand is that and what kind of products they're selling. Truthfully, I have never heard of the brand too until today. I was invited to come to their launching at PIK AVENUE MALL. Turns out, they are quite a big brand in Korea and their store is in Gangnam, Seoul. First thing that captured my eyes when I saw their products are their best seller hand cream! The packaging is so adorable and colourful to look at. It has different kind of flavours like cherry blossom and cotton powder. Even the names are so cute! Who can resist this hand cream? There's plenty of demand for SKINAZ products in East Asia therefore they decided to enter Indonesia's market since simple, yet functional and unique products seem to be more popular than fancy luxury products. They offer a lot of simple yet functional products such as this stick blusher that comes in 3 shades; baby pink, sugar peach, and soft coral. One of their best seller products is their lip tattoo, but I didn't choose their lip products as I've got way too many lipsticks right now. I chose their CAT EYE EYELINER and CAT EYE DUAL EYEBROW TATTOO instead. Finding the perfect eyeliner is one of my make up goals. You know why? Because it is so hard to find an eyeliner that really works on my eyes! Some brands claimed that their product is waterproof, long-lasting, and won't smudge. But when I used it on my eyes, I can see some eyeliner smudging below my eyes. Every one has different type of eyes, mine is probably the worst though. Since my friends can easily use any eyeliner products and it won't smudge at all! But if I use the same product as my friends, the result won't be the same. It will smudge on my eyes and I truly hate it when it smudges on my eyes. Hopefully, SKINAZ Cat Eye Eyeliner will be the perfect eyeliner for my eyes. Let's try it out! First let me test the colour on my skin. I think I chose the wrong color though since it is very black, like literally black. But I like the sharpness of this eyeliner and it comes in a marker-like shape. As you can see how thin this eyeliner when I slide it on my hand. Super love the sharpness! This product will easily help you make cat eye eyeliner without an error. Now, let's try to rub it with my finger. Most eyeliner will usually smudge. *DRUM ROLLS* OMG, SKINAZ eyeliner didn't even smudge! I have tried rubbing it softly as well as hardly and both times the eyeliner managed to not smudge at all. I have posted the video of me trying to smudge it with my finger on my instagram here. Nowadays, "eyebrow on fleek" is the trend. 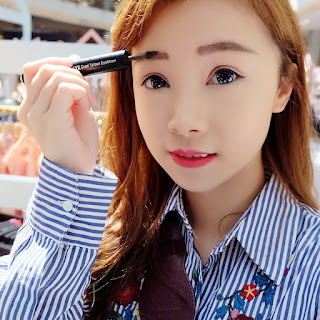 You can go out without any make up but your eyebrows must be on point because eyebrows play an important role in creating a decent natural face. I used to have no eyebrows like literally theres only a few strands on my face and people mocked me with "bald eyebrows" since I usually go out without any make up at all. Yes, I am that lazy. I don't even bother to draw my eyebrows at all. Fortunately thanks to the technology nowadays, I did eyebrow embroidery which miraculously saved my bald eyebrows. My eyebrows now have a lot of hairs but it still look natural and I still need to draw my eyebrows every time I have an event. 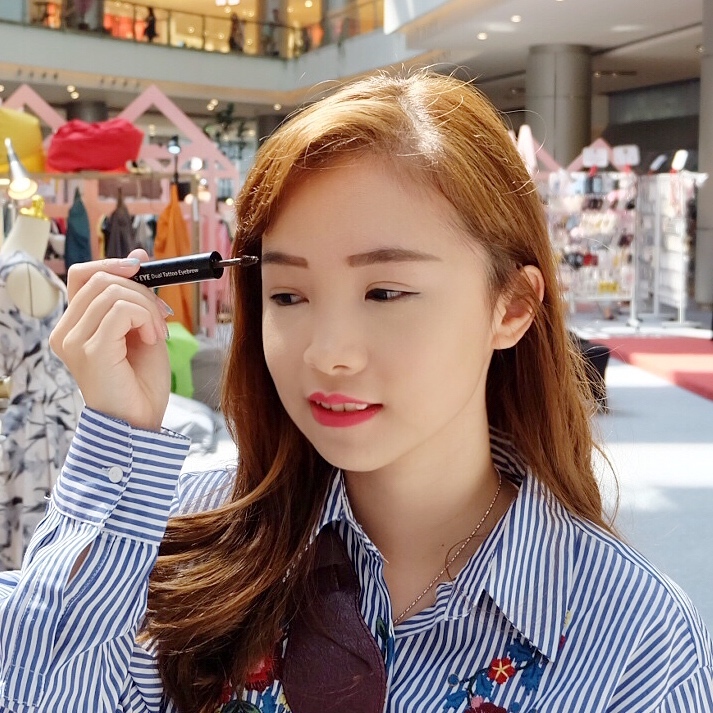 I have been using eyebrow pencil for years and I think it's time to change to the current trend which is liquid-based eyebrow marker and mascara! A lot of make up artists used this type of eyebrow products because it creates a natural look. The tattoo creates a long-lasting brows and not to mention, protects the brow from sweat, smudge, and water. The mascara gives your brows a neat and plush look. I chose Dark Brown colour since I have just dyed my hair to brown colour. I think this product will come in handy considering that I don't want to dye my brows. Ever since I dyed my hair, my brows are killing me with its black colour. It doesn't match my hair colour at all which is why I decided to choose dark brown colour instead of black. Dark brown colour will also make my brows look more natural. When I tried the eyebrow pen(I don't know what its called? ), it has a very thick texture, while for the mascara it has a slightly less thicker texture than the pen. Just like the eyeliner, I tried to erase the product from my hand. The mascara is gone but the eyebrow pen managed to withstand all my intense rubbing! This is such a huge plus because I tend to swipe my face a lot without realising and thus sometimes my brows will get smudged. With this product I am sure that no matter how many times I sweat or wipe my eyebrows area, my eyebrows will still be on point!